Home » Game Reviews » Crypt: A Quick Adventure Filled With Rivalry! Written by: KristaG on January 21, 2019. Sibling rivalry is far from uncommon, but add to that a recently deceased father (the King, no less! ), everyone being jilted on their inheritance, and the shared knowledge that all of those promised heirlooms now reside in the family crypt and things are sure to escalate — and quickly! Designers Andrew Nerger and Jefferey Chin of Road to Infamy Games (a.k.a. R2i Games) combine all of this into a fast-paced card game for 1-4 players who aren’t afraid to rouse their servants and do a little breaking and entering. How far will these decieved descendents push their servants to meet their greedy desires? Will tempers flare during the mad dash caused by the quickly fading torchlight? Which of the royal siblings will come out on top? Let’s roll the dice and find out! I love these colors and the artwork! Before I jump into my review of Crypt, I want to take a moment to discuss how beautiful and unique the game actually is. The box itself evokes the image of a sarcophagus complete with a stone effigy in the dead king’s likeness. Open it up, however, and you will find the body of the king at the bottom of the box! I also really like that box top is used as a component in the game. The color choices of purple, turquoise, red, and black are not only a striking combination and contrast from the colors seen in most of the games I play but are also easily recognizable as colors that often surround royalty. The character cards depict a range of ages, gender, and overall appearances. While this is becoming more and more common, I appreciate artist Jeffrey Chin’s attention to the subject and the inclusion of a plethora of character options that also allow for an extra deck to be added for a larger game. 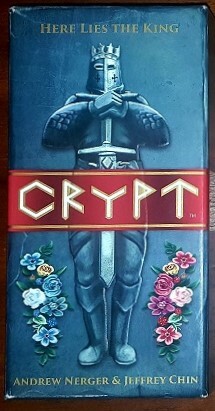 Set up for a game of Crypt is determined by the number of players. Fortunately, there are icons on the Treasure cards to make it easier when adding or removing the specified cards from the game. After adding or removing cards to the Treasure card deck, the deck should be shuffled and placed face down as a draw deck. The Collector cards should be placed within easy view of all players. The cool thing about these is that they can be placed either “A” side or “B” side up for added variety! Each player then chooses their character and takes the corresponding “Servant dice” of the same color. 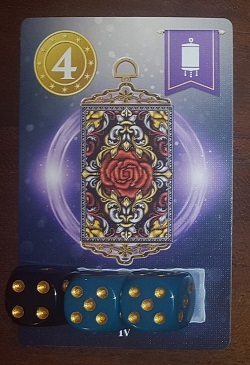 These dice should be placed on their Player card. Players can choose the first player however they’d like. We tend to do a roll off for our games just to keep things simple (highest dice roll = first player). The chosen player receives the “Leader” Torch card. 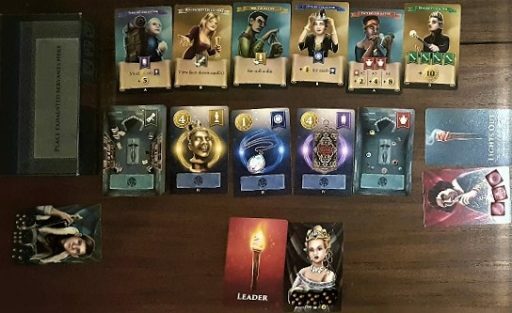 In a 2-player game, this person also receives the “Lights Out” Torch card, but in larger games, that card will go to the player on the Leader’s right. As I mentioned before, the box top is also a game component so that should also be kept within reach of all players. Though setting up the Crypt is technically not included as part of the game set up, I tend to include it as such since the game doesn’t really begin until the Crypt is prepared. This is done by “revealing” Treasure cards. As with the size of the Treasure deck itself, the number of cards used to build the Crypt is determined by the number of players. The first cards that are drawn are placed face up while the last card or cards is placed face down (there’s a really nifty chart in the rules to keep this simple). Once the Crypt is ready, players are able to enter the Crypt in search of treasure beginning with the Leader and continuing to the left. On their turn, a player gets to choose between trying to claim Treasure cards or recovering their exhausted servants. 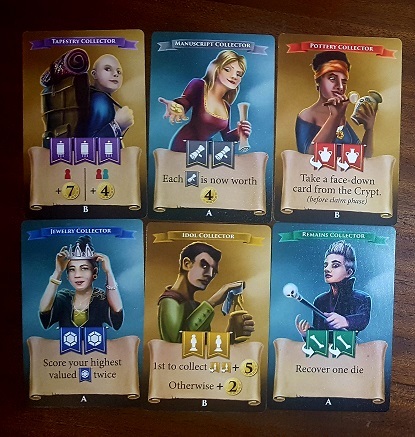 When claiming a Treasure, a player can place any number of their 3 Servants onto the Treasure card(s) of their choice as well as choosing the amount of effort they want the Servant to exert (designated by the face value of the die). If placing multiple servants on the same card, the chosen values must match. See a card that you want that already has another player’s Servant on it? No problem! As long as your Servants are able to put in more effort than another player’s, you can push them out of the way and still potentially claim the Treasure for yourself in the next phase! Be careful, however, as the more effort a Servant needs to exert, the higher the probability of them becoming exhausted more quickly (more on this in a moment). Should a player have previously exhausted Servants, they can choose to recover them from the box top instead of vying for treasure. The player with the Lights Out card takes the last turn for this part of the round. When claiming on the last turn, however, they may only place Servants on 1 Treasure card of their choice. The 6 Collectors, some “A” side and some “B” side. 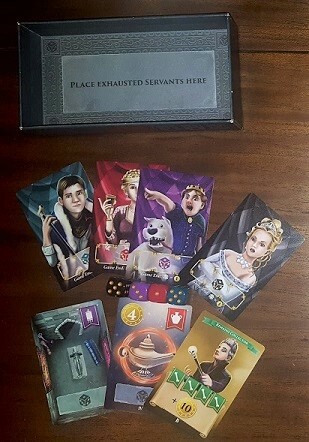 Once all players have finished their turns, all unclaimed Treasures are discarded from the game and it is time to check on the poor Servants to see how exhausted they are. I can only imagine that doing our bidding and running around the endless corridors of a gigantic crypt in the middle of the night while fighting off other servants must be tiring! To check for exhaustion, players will roll each of their used Servant dice and compare the new roll to their original values. Should the roll be less than the starting value, the Servant is exhausted and is placed into the box top. Regardless of the dice rolls, the player that put forth the most effort for a Treasure gets that Treasure card for their collection. These collected Treasures should be sorted by type, but placed face down in their play area. If a player ever has enough Treasures to meet a Collector’s needs, they get to claim the reward (not the card itself as all players have access to these rewards if the needs are met). Some of these rewards include extra Coins, re-rolls, or dice recovery among other things. After all of the Treasures have been collected and remaining Servants returned to their proper places, the Torch cards are passed to the left to signify the beginning of the next round. The game continues until the Treasure deck is emptied, which signifies the final round. At the end of the game, the final scores are tallied and the player with the highest total wins. Crypt first appeared on Kickstarter in April of 2018, where it more or less exploded with popularity and now that I’ve gotten to play it myself, I can certainly see why! The mechanics, the colors, the art, the speed of the game…it’s all great! To be honest, though, I feel like explaining how to play the game takes longer than actually playing it does! Once we decided to just dive right in and start playing, the game was really easy to pick up and we had fun getting ourselves into the roles of our characters as we ordered around our servants and duking it out for treasure. My favorite characters to play as tend to be the “icy” looking female on the black card or the child with his dog on the purple card. I really like that there are no language barriers or much of any reading involved so I can play it with anyone once they understand how the dice mechanics work. The fact that there are game variants available on the Road To Infamy website has opened the game up to even more opportunities to accompany me to our weekly game night. There’s a co-op variant for 2-players, rules for adding a second deck, and, my personal favorite, the “Cursed Treasure,” which demonstrates that being points hungry is not always a good idea. We have had a blast playing this quick filler and soon everyone else can too as the game is slated to hit retail on January 25, 2019!